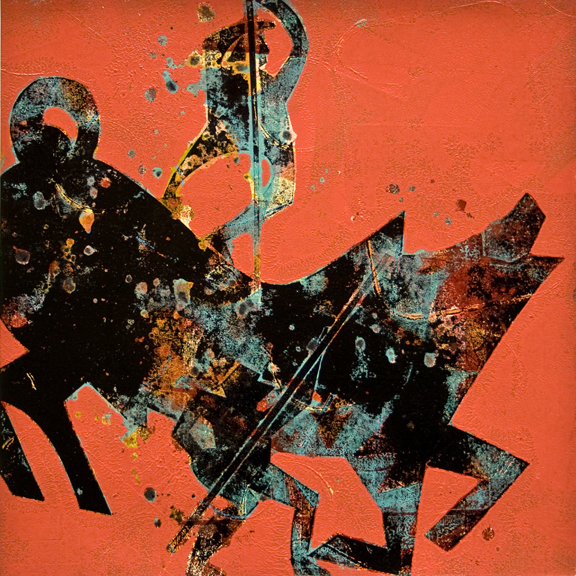 The Calydonian Boar is one of many new Monoprints and paintings on display in my solo show at the Hardware Store Restaurant Gallery, August 3 thru September 5. I thoroughly enjoyed the Vashon First Friday opening reception. Thank you friends and patrons for stopping by to see what art I have been making this past spring and early summer. The Hardware Store Resturant and Gallery is a celebrated destination Vashon eatery and unique venue for artists. Thank you Hardware Store Restaurant and Gallery owner Melinda Sontgerath and manager Alex Van Amburg for an invitation to show in the gallery. The Calydonian Boar hunt in Greek myth celebrates the victorious hero Meleager and heroine Atlanta. They are each also part of the Argonautica crew and the epic quest for the Golden Fleece.